Ben Kingsley. Jim Sturgess. Kevin Zegers. Natalie Press. Rose Mcgowan. Tom Collins. William Houston. Action/Adventure. Drama. Thriller. Violence. 1980s. 1990s. Northern Ireland. Abduction. True Stories. Chases; Cars, buses, etc. 01 Nigel's Choice. Romance. Martin McGartland was an unemployed Republican fence, a petty crime that led to the IRA kneecapping of his partner. Picked up by the police he soon found himself operating as both an informer for his Special Branch handler, Fergus, with whom he developed a close relationship, and at tremendous risk, infiltrating and moving up within the ranks of the Provos while routinely betraying their activities; the title coming from the 50 murders that it is believed Martin directly prevented. 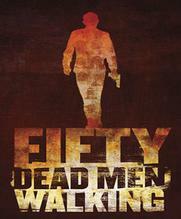 'Fifty Dead Men Walking' works well as a suspense filled action/drama, encapsulating the atmosphere of Belfast in 'The Troubles', successfully illustrating the dirty nature of such a war and the inescapable betrayals that come with it.